Utagawa Yoshitora (active 1840-1880) Attacking a Castle, c.1864. Oban Triptych. 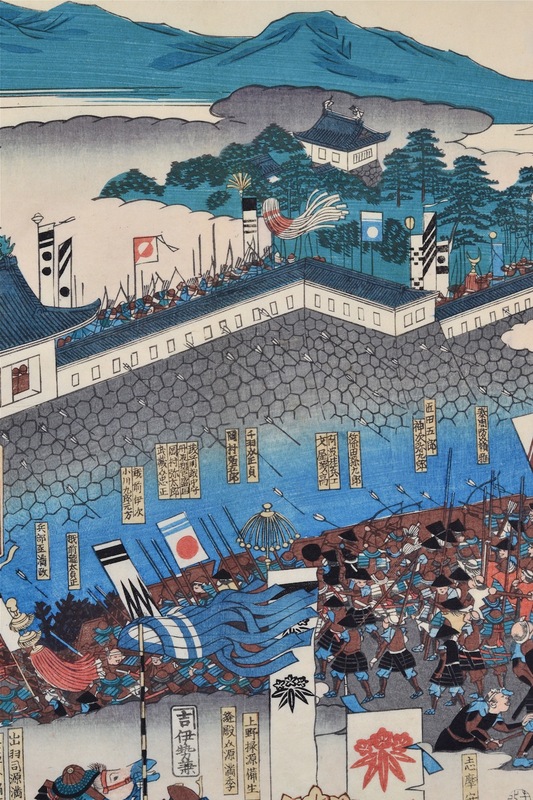 This outstandingly clean and fresh triptych is typical of the 'great armies' genre that was popular with Utagawa School artists in the mid-century. These big set piece prints revived scenes from the great medieval past where powerful clans fought pitched battles for control of territory before final unification. This age of legends has much in common with British accounts of the court of King Arthur - historic characters around whom fantastical mythologies and heroic stories have been embroidered. The revival of these histories is often occasioned by change, social upheaval or national anxiety, as is the case here. As censorship began to be relaxed with the change of government in the 1860’s, ukiyo-e artists found a ready market for previously censored, historical imagery. Yoshitora was a pupil of Kuniyoshi and in this print revives much of his teacher’s style and composition. He is perhaps best known for his very modern prints of westerners and industrial subjects known collectively as Yokohama-e. This print is very fine and very fresh indeed. The surface is alive with hundreds of warriors, the air is filled with the arrows of attacking and defending forces and the pages bristle with small vignettes of military life. Surprising, and hugely successful, is the landscape depiction, influenced by Hiroshige and Hokusai. Clouds interrupt the zig-zag walls of the castle, breaking open the space and adding a curious aerial perspective to the battle scene. Elsewhere, the surface buzzes with pennants and flags, lances, bells, carts and men - all flowing like sand onto the bridge in the left sheet. Very fine colour, condition and impression. Three sheets unattached and unbacked.